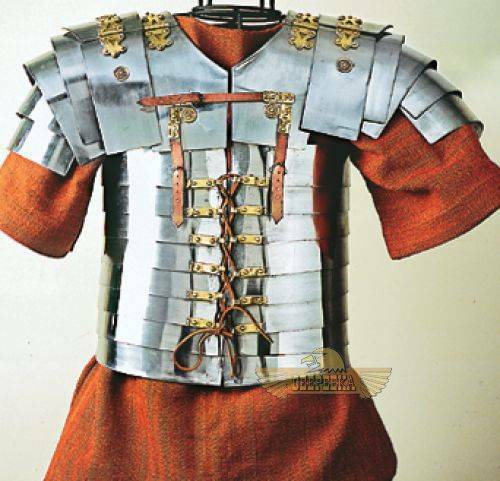 his style of armour was used in Roman legions from about 100 A.D. till 300 A.D.Our reproduction is based on parts of armour found at Corbridge near Hadrian’s wall.It fits chest sizes 40" to 44". The model we are offering here was handmade from 18 gauge stainless steel, trimmed in brass and weighs abt. 11 kgs./24 lbs. Though Romans had not invented stainless loricae during their time, our model is very popular amongst reenactors, because it always remains shiny and cleaning and recoating with grease after each performance is not any more necessary.